This is a unique one of a kind hand painted Silk scarf drawn in white resist then brought to life with soft purples and burgundy tulips in pots. Beautiful accent piece. This 8" x 54" scarf is 100% silk. In many of my scarves I either hand draw the designs or I design and carve my own reliefs, build the blocks and print my designs with textile inks to imprint the design onto the silk. 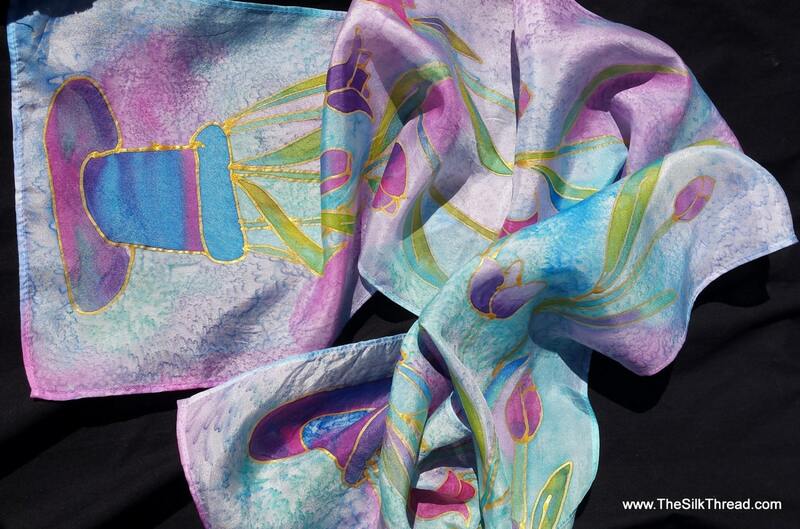 The results are classic designs, beautiful colors and a one of a kind silk scarf. This is pure silk fabric which gives the lovely "shine" that is so desirable in silk clothing and accessories. Use as a scarf or hang on the wall for a beautiful accent! Each piece is hand painted and dyed by me, artist M Theresa Brown. Each of my silk scarves and paintings are unique. Everything hand done here in my North Carolina studio on my mini farm.